You are currently browsing the category archive for the ‘Knitting’ category. 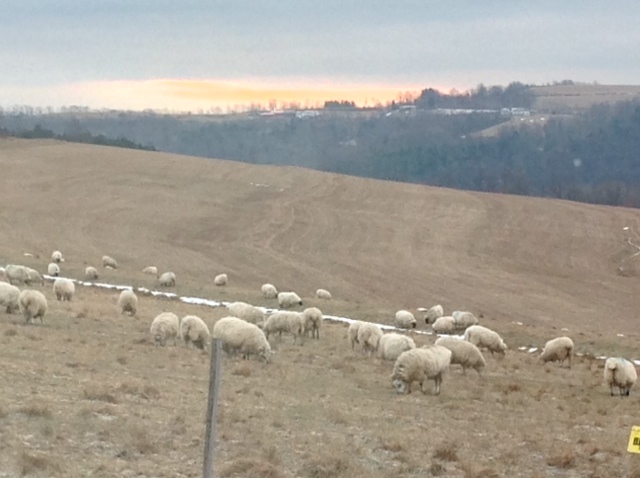 I’ve been away at a Knitters Retreat at Mount Saviour Monastery for the last 5 days. We shared projects, enjoyed wonderful food, fellowship, were able to pray with the monks often, go for walks and more. As it is Martin Luther King’s day today, in this morning’s homily Fr. Joseph Gabriel talked about Martin Luther King and what we learned from him.. The image shows the view from the guest house where I was staying. I captured the image from the window near the table where I was enjoying a cup of tea. Very cold, has been teeth chattering cold all day. what to do with the ashes of two of my pets. We still have Dafni’s ashes and today we picked up Yogi’s ashes. Hers came to us in a sort of treasure chest, but his came in a box with a Himalayan type design, very fitting for this breed. A caring Vet … and for friends who have shared their thoughts and hugs with us. It was mostly leftovers today, healthy eating. Thick navy blue fleece pants, long sleeve orange/red cotton tee, green thick hand knit sweater. Bright red socks. Nothing matches, but I’m warm. A sweater, knit in one piece using wine colored yarn I spun last year. I spun the yarn too thin for a heavy sweater, finally came up with something that would work for a warm but light weight sweater. The yarn is wool/alpaca and so it will should be warm without being bulky. Being only a little over 5 ft tall, I find lighter weight, finer knit garments more comfortable than heavy one, but they sure do take a bit longer to make. I ran out today just long enough to run to the library, now I am going nowhere. Sabbath… Restoring the Sacred Rhythm of Rest by Wayne Muller. A friend has been reading this book and recommended it. I put a hold on it at the library and have just started it. That we don’t get all the snow that is predicted for this area in the next two days. House is quiet, everyone working on their own things in other rooms. A necklace that I have worn for more than 13 years, a cross with little diamonds and a ruby. It was one of the last gifts from Mom before she went to be with her Jehovah. work on items for a March art exhibit, get things banner and needle felting supplies ready for Saturday’s guild meeting. I was very pleased to finished both socks at the same time. 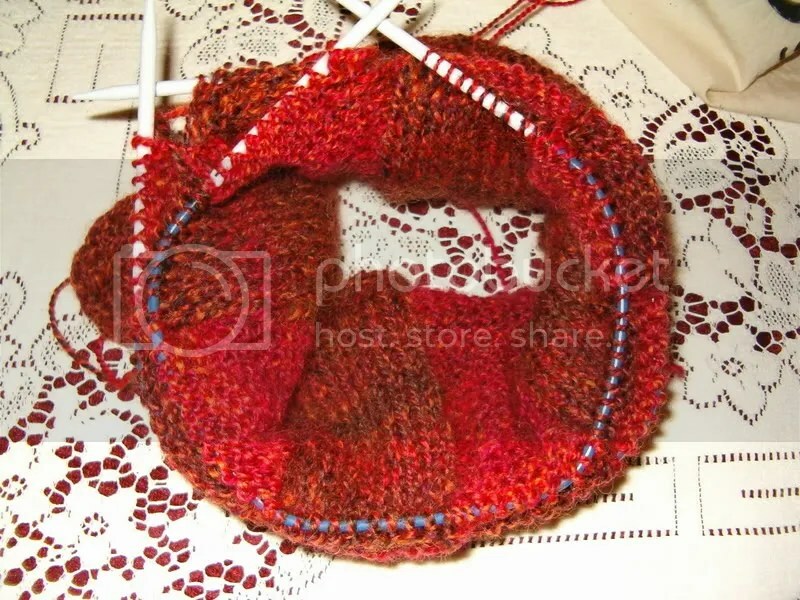 I have a feeling I’ll be knitting most of my sock using the 2 socks on 2 needles method, no more 2nd sock syndrome. The only thing I didn’t like was how the heel skewed the yarn. I plan to do toe up socks next and then add an afterthought heel after the rest of the sock is done and that way maintain the same color pattern all the way through the sock. The Princess Wrap is done! I only needed a little bit of my second skein of yarn… for a nice large wrap. I probably could have gotten away with just one skein of yarn. It blocked out beautifully! I’m planning on giving this shawl to a special someone and making another for myself in the Musk color that I have in stock. While some of the ladies knitting this shawl have had a little trouble with their first lace project, they all love the yarn. For some time I have been suffering from ‘second sock syndrome’. Those of you who are sock knitters are probably very familiar with this problem. I have always knit my socks on double point needles, but after having to replace needles countless times due to breakage, pets using them as toothpicks, or losing them, and since I needed some size 1 circulars for another project, I decided to try using 2 circulars to knit 2 socks at the same time. I hadn’t tried this before and didn’t have instructions for doing 2 socks at the same time, but I understood the concept. Or so I thought. 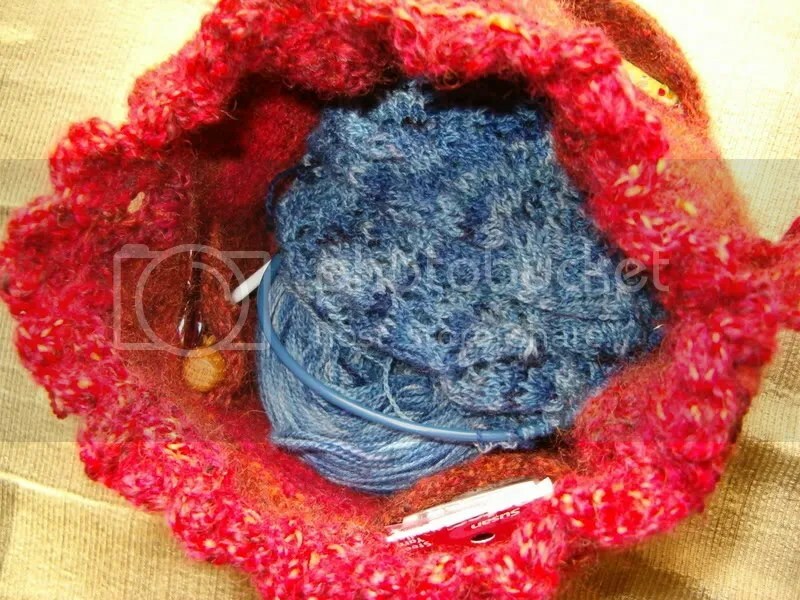 You cast on your stitches and then divide, placing half the stitches on each of the needles. Right? I cast on for the first sock and then cast on for the second one, realized it was a little more complicated when adding the second sock. 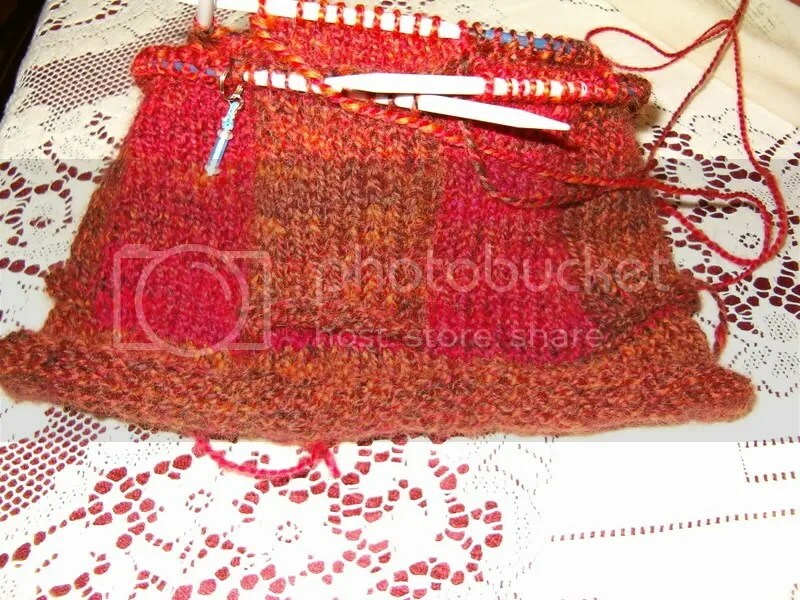 It was close to 9pm and rather than leave it for another day and determined to start the first couple of rows of my socks, I cast on the stitches unto a straight needle and then moved the stitches onto the 2 circulars. For my next pair, I’ll take the time to figure out how to cast on and divide for 2 socks, but for now, this worked. My progress so far. 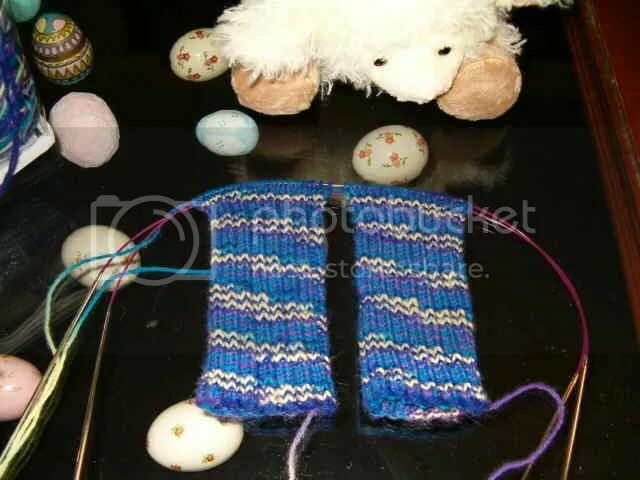 I find it an easy way to knit socks and the only problem so far was when I was chatting and knitting and forgot to switch yarns, knitting the socks together. I realized after taking the photo, that it might be a bit confusing. The socks are on top of a curio table with handmade Easter eggs under the glass and with a little lamb keeping an eye on things. 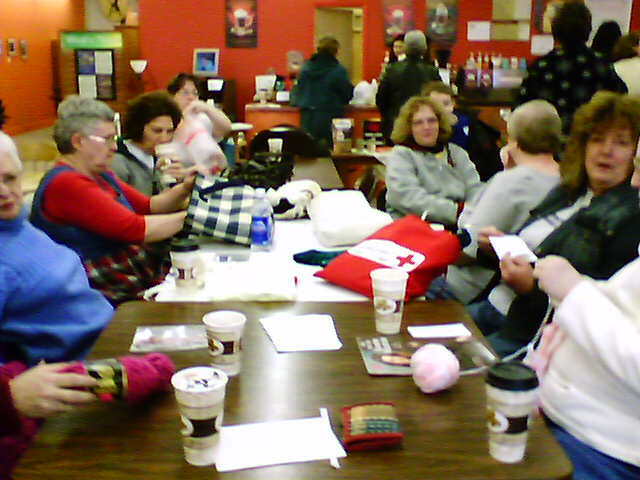 The knitting group that was meeting at the coffee bar/bookstore moved to a library when the book store closed. The music store next door expanded into that space but kept the coffee bar and added a permanent stage. We’ve started meeting there again. Today anyone who arrived with the Monday blahs was soon tapping their toes and knitting needles to the sound of popular songs and oldies but goodies. 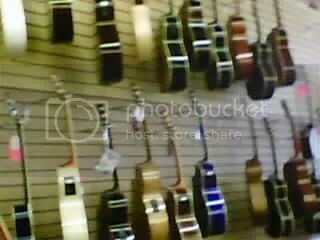 I took a few photos with my camera phone.. they are a little bit blurry.. sorry! Here is a photo of one of the walls around the area where we sit, there are also pianos, racks of sheet music, diner booths etc. The group jamming across the store … notice there is plenty of space for dancing or to pull up chairs. Knitting, spinning, chatting, toe tapping music, gourmet coffee and snacks… a sure cure for the Monday blahs. What do you see when you look at this photo? Looks comfortable and it is. It’s where I like to sit and knit or read. Mom’s cabinet is close by always reminding me of family dinners and all the little ‘memories’ she stored in there. Now I’m storing memories in there. And I really like that old wood and brass lamp that we found in a estate sale for $5. 00. That it is a little worn, adds a little character. But in this corner, somewhere, is a black hole. Last night I set down my knitting to let dogs out and get them settled for the night. When I picked up my knitting, a jewelry quality stitch marker was gone. I checked between the cushions, down the side of the couch, down the back of the couch and then crawled on the floor looking around and under everything. Gone! Once again, I’ve lost another stitch marker to the black hole in my house. It has gone wherever numerous other stitch markers, double point needles and other small items have gone to, never to be found again. 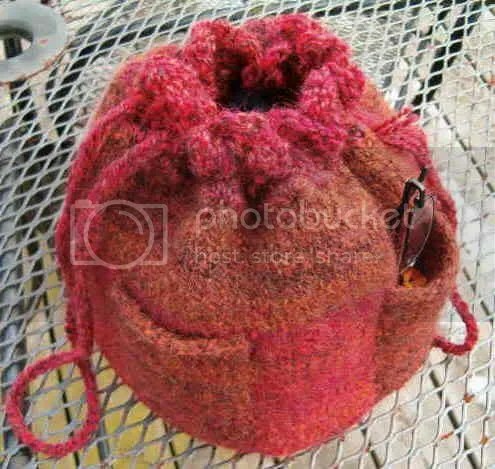 A while back I posted photos of a pocket purse on my old blog. I’ve had quite a few people ask me about the pattern, but just as many were curious about what was in the bag. I finished the project in the bag a while ago but just today got around to taking photos of it. I’m reposting photos of the bag and adding photos of the blue in the bag. Inside the bag – Pattern Heartstrings Hanging Vines – Divine Laceweight merino (both in stock on my website). 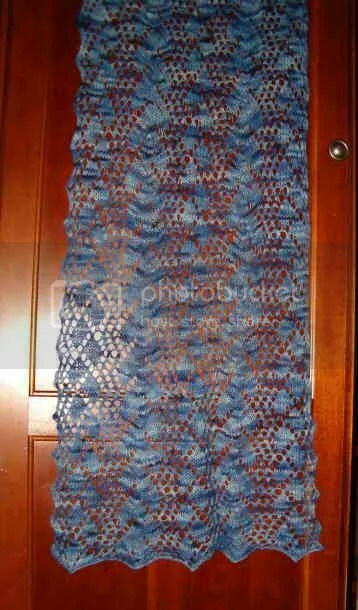 I’d already used part of a skein for a scarf, but still had enough to make the Wide Scarf version of the pattern, with yarn left over. 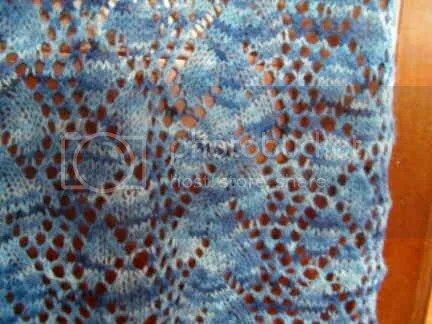 I love this pattern and plan to make a full sized shawl and also a throw using the instructions included in the pattern. On Monday one of my favorite places closed. A Sweet Read was a used book store with a coffee bar and where a group of people met once or twice a week to knit, spin or work on needlework. The owner of the book store started the group last year and for a while there were only a few of us going. Here is a photo I took with my phone camera on Monday. The photo is blurry but you can see that there were quite a few there even though some were missing. Notice all the coffee cups.. I’m going to miss my Mud Slides. At first we only had knitters or crocheters, but I started taking my spinning wheel and now there are 4 or 5 others that spin. Besides meeting at the book store, the spinners have also have been meeting at my place so I could show them a bit more about fiber, tools and spinning in general. A couple of wheels on the last day …. Vicki the store owner gave me a gift, a nice little book shelf. I was delighted to have it, but once I got it home I wasn’t sure where to put it. I finally decided to put it in my bedroom to see if I could keep my pile of books under control. The only place it fit was between hubby’s chest and my dresser. In that spot there has been a large dog bed for about 10 years, Lila’s bed. We lost Lila last year, and than 2 months later we lost Dafni her granddaughter. For a little bit Karma slept in our room, but now she’s with her co-owner. I’ve had a hard time getting used to not having a furry companion sleeping in our room at night, but I decided it was time for another change. I removed the bed and put the bookcase in place. It looks good. It makes me sad to see Lila’s empty dog bed. It makes me happy to see books lined up on the shelf… This is a change for the better. Meanwhile, then knitters met at the library on Friday and that didn’t work too well, parking was iffy, place was cramped and no coffee! A glitch in Blogger switching from old to new version has made it impossible for me to post updates on the ‘A Life Overflowing’ blog and so I’m posting my updates here. In this group we are paired up with another person, round robin style. Partners are to pray for each other, keep in touch and since this exchange has a coffee/tea/drink theme, we are to gift our partner with items we believe they will enjoy based on info they’ve supplied. The most recent request or assignment is to post photos of our favorite cups. 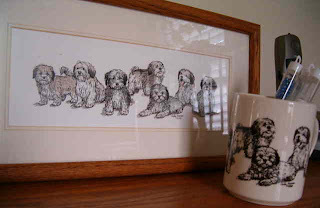 Here are some of mine …. 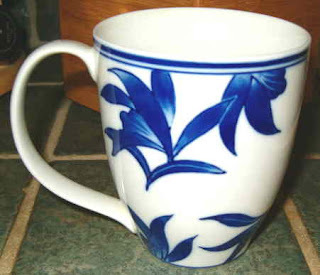 A gift from daughter Tina, porcelain with ming style cobalt design, comfortable to hold, nice and big. 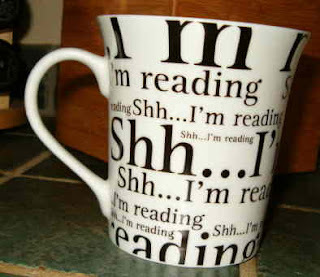 A gift from friend Lynn L. If I’m reading, counting stitches, whatever and someone starts talking to me while the cup is close by.. I only need to lift it or point to it and they understand to give me a second to finish counting or reading. I think there needs to be cups that say. Shhhh.. I’m thinking… or maybe just Shhh I’m _________ and then one can fill in the blank . A gift to myself… note the little dragonfly and garden theme. 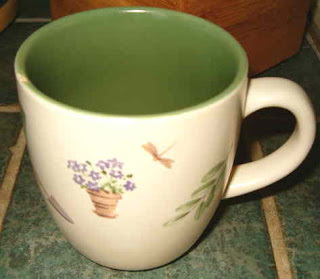 A nice stoneware cup for maintaining the temperature of the drink it holds. A gift from Sis. 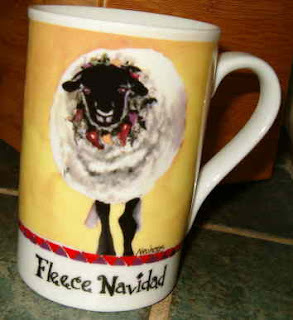 Just before she gave me this, someone had greeted me saying Feliz Navidad! When this person greeted me.. I thought.. what did they say about fleeces? Duh! And then I realized they were wishing me a Merry Christmas. Yes, I know, it’s not a cup. But you have to have a creamer right? 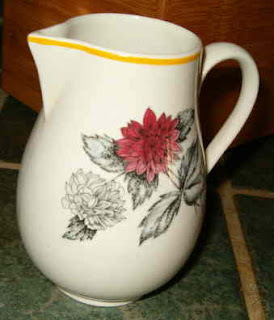 This cute little staffordshire creamer caught my eye because it has dahlias on it and Mom loved Dahlias. Mom, known to family members as Mamita, also loved roses. 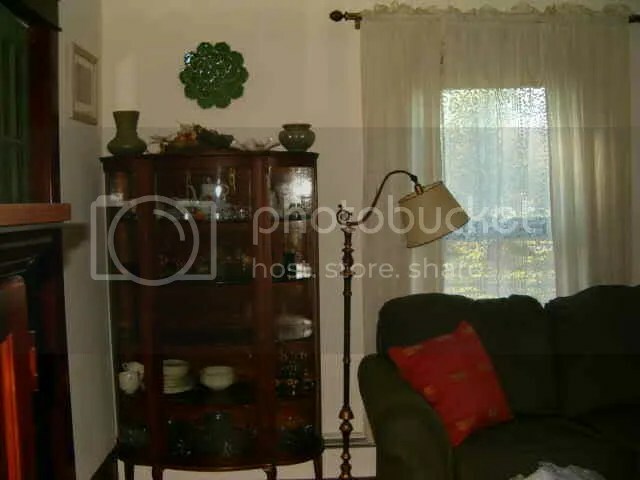 Before she passed she told me she wanted me to have her china cabinet. I spent many hours as a child making sure things in there were dusted. Along with the cabinet I brought home some pieces with roses. The cup on the far left was a gift from Lynn L and it just fits right in. 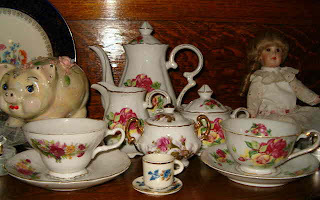 The tiny little cup in front was one I gave Mamita as a gift. She like miniature things. The saucer says. “I love you, Mom”. 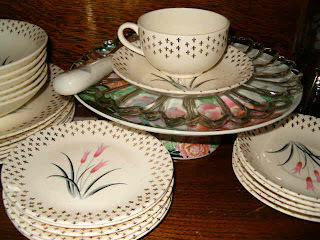 Also in that cabinet are some of Mamita’s art deco cups.. I don’t dare use them for fear they’ll be damaged. Packed in a box are my grandmother Catatlina’s tiny cups. I didn’t have a place to display them safely and had packed them away and only just remembered that I had them. Now I can put them in the cabinet with the others.